Used this jig (clamp fitting only) fitted to a fixed rod design to improve the squareness of planer and chiesel sharpening. very easy to use and set angle by moving the rod away from the wheel and it usually came out square. 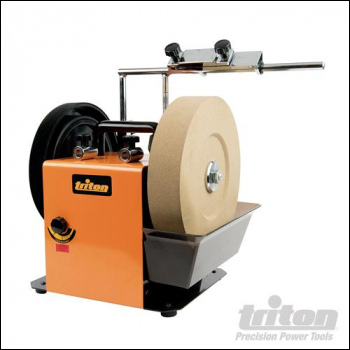 Obviously originally produced to fit the Triton grinder kit which is the best option if you have this grinder. I used it on a Silverline Grinder plus my own jig. Good price if you can make a extra holding jig.